In the past couple of weeks, I’ve become increasingly interested in learning the proper techniques for seed harvest and storage. I’ve never ventured into this area of gardening before, so I have lots to learn. I love the idea of growing my own new plants from plants already at Coppertop — a great, free way to add more of my favorites. As I prepared to finally cut back the tall delphiniums, their spent blossoms were brown and rattled with seeds when touched. 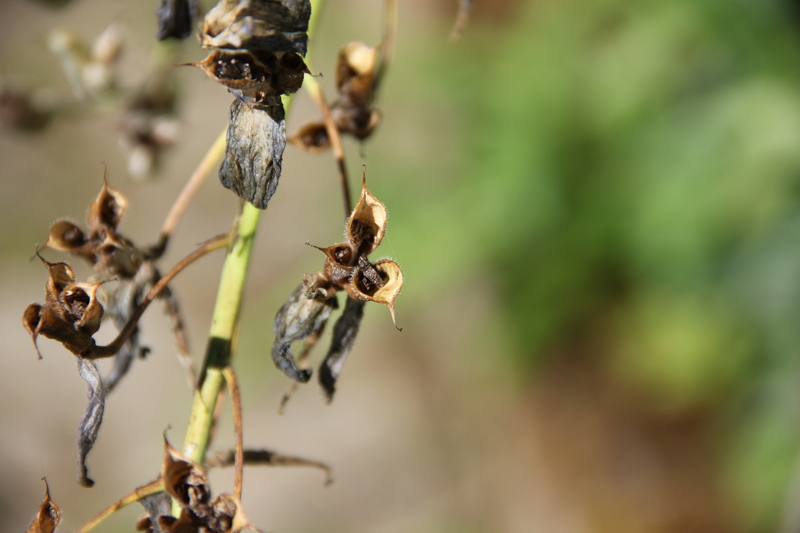 Some of the seed pods had already burst, revealing their small brown seeds. Harvesting these was almost too easy! 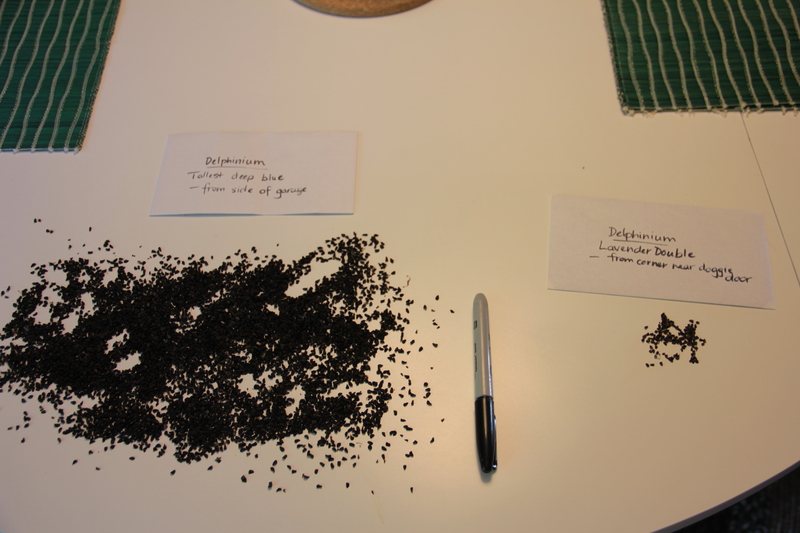 I separated seeds from the two colors of flowers I’ve been able to harvest so far. It’s easy to tell which of the delphiniums are the most prolific. Soon I’ll harvest seeds from a few of our favorite white delphiniums as well, but they’re not quite dry enough yet. Some sources warn that plants may not grow true to their parent plant, because of hybridization. 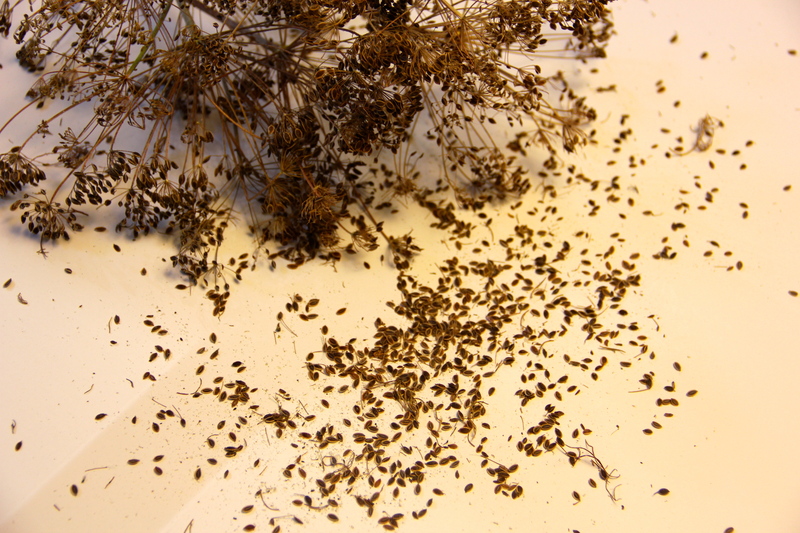 The only other seeds I’ve harvested this week are dill seeds. I started dill weed plants from seed, allowed their yellow flowers to develop on 4-foot stems on our sunny deck, and have watched the flowers brown. I’ll use most of these seeds in pickling green beans and carrots, but I’ll save some to grow new dill plants. 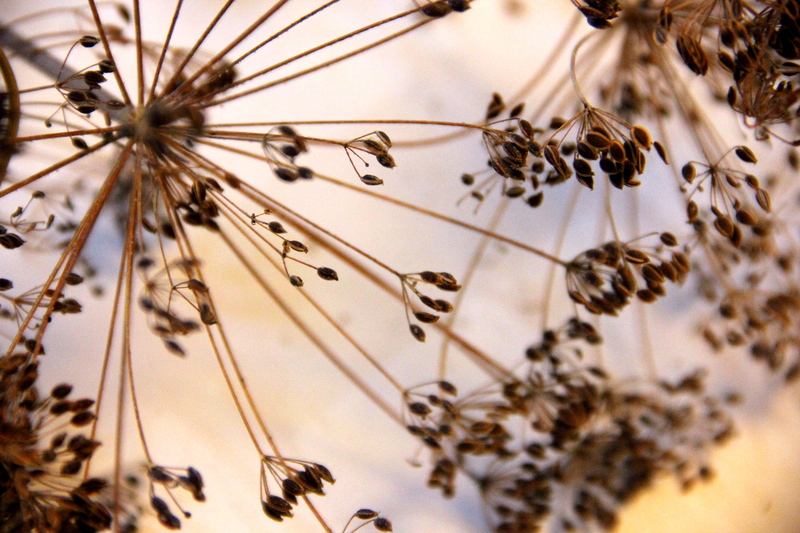 Next on the seed saving agenda are the coriander seeds from the flowering cilantro. Once they are dry enough, I’ll enjoy crushed, dried coriander seeds sprinkled on roasted cauliflower. Good thing that the final cauliflower heads from my first batch of plants are ready for harvest! 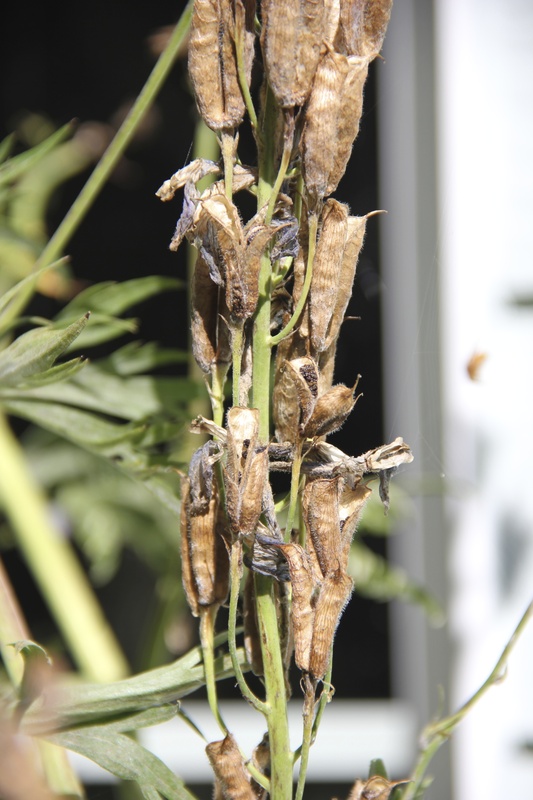 This entry was tagged delphinium seed, dill seed, gardening, Olympic Peninsula, seed harvest, seed storage, Western Washington. Bookmark the permalink. How cool is this crazy internet at connecting us to others?! 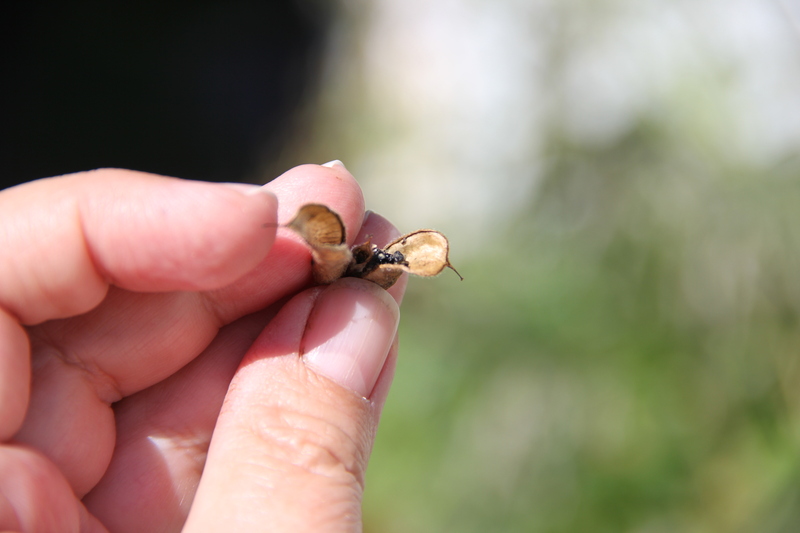 A Russian online article is now featuring one of my delphinium seed photos HERE. Love it!